The Shoppes at Redstone Square on Zierdt Road is scheduled to open July 11. Nearly a decade ago, two visionaries – Jim Gendreau, owner of Tailwinds Development in Lake Mary, Fla., and Colliers International Director David Garnett – stood on a desolate corner at Huntsville’s westernmost point outside Redstone Arsenal Gate 7. Perhaps Redstone’s most discreet entry/exit point, Gate 7 sits at the corner of a narrow, winding two-lane street known as Zierdt Road; and Martin Road, which disappears for most drivers for eight miles across Redstone Arsenal, then reappears three miles from the Huntsville International Airport and the Jetplex Industrial Park. Make no mistake, 10 years ago there was nothing for nearly two miles south, north, or west of that corner in either direction except a Mapco Mart on the south side, frequented primarily by boaters headed five more miles south to a bend in the Tennessee River to launch their boats. Where most people see nothingness, real estate developers see potential, and Gendreau and Garnett plotted to build something big there one day. Jump ahead seven years and numerous residential developments had grown up south of that corner including the Willows at River Landing, Legacy Cove, Riverwoods, and The Preserve at Wheeler to name a few. All along Zierdt Road north, are upscale apartments and homes along Lady Anne Lake at Edgewater and along Martin Road west at Natures Walk and Lake Forest. Three years ago, Gendreau and Garnett, working closely with the City of Huntsville, purchased that same plot of land on which they stood 10 years ago, and built a 101,000 square-foot Publix-anchored shopping center called the Shoppes at Redstone Square. It is expected to open July 11. According to Tricor, the leasing agency for Tailwinds Development, the new 45,000 square-foot Publix grocery store at Redstone Square will serve a much-underserved residential area and provide a convenient shopping stop for employees exiting Redstone Arsenal heading home at the end of the day. 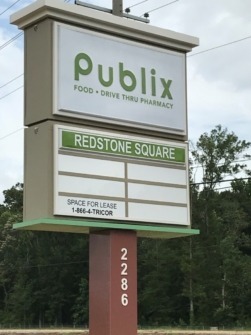 In fact, the Publix in the Shoppes at Redstone Square is one of three – two new and one existing – Publix stores within five miles of each other in Huntsville and Madison. The company is renovating space for an even larger, 54,000 square-foot Publix behind Applebee’s at 302 Hughes Road in Madison, scheduled to open in late October. The store at 8000 Madison Boulevard across the intersection of Madison Boulevard and Zierdt Road will remain open as well. Currently, Tricor has leased space to a yet unnamed nail salon, hair salon, and dentist’s office; however, John Ashby, owner of Madison’s Mangia Italian Restaurant on Hughes Road and U.S. 72, will open a second Mangia location in the north end of the Shoppes at Redstone Square. Known for its pasta, salads, pizza and calzone, the new restaurant is a good 10 miles from their first location. “Tailwinds owns six parcels of undeveloped land in front of and surrounding the Publix shopping center,” said Gendreau. “Anyone interested in those parcels or in leasing space in the shopping center can contact Deidre at Tricor (deirdre@tricor.net) for more information. One can’t appreciate the extraordinary growth of this part of town without acknowledging the Zierdt Road improvements. Until two years ago, the 3.5-mile stretch of road between Madison Boulevard and Martin Road was one of the curviest two-lane backroads in Huntsville, sneaking underneath I-565 along Huntsville’s razor’s edge boundary with Madison. The $26 million Zierdt Road improvement project is in Phase IV of four. The two northbound lanes are complete with a non-working red light installed at Nature’s Way. The southbound lanes are 90 percent complete; however, the city is looking at another 30 months of construction to create a 12-foot multiuse path on the west side; seven lanes at the intersection of Martin and Zierdt Road; and six lanes at the intersection of Madison Boulevard and Zierdt Road, which will give access to the new Town Madison project and the new yet-to-be-named baseball stadium at that corner. That construction begins this fall but, due to traffic issues, is not expected to reach completion until 2021. Drury Inn & Suites in Huntsville nears completion Growing pains – Is the Madison County area growing too fast?